Get deep insight on how to structure your organization, develop your offer strategy, and grow your Managed Services business. We know what's trending in managed services. TSIA's detailed analysis of the industry has identified a top set of managed services business challenges that we address through our membership program. What are the best practices for managing base client revenue, contracts, and client satisfaction? What is the process required to build standard managed services offerings? How do I create an executable and measurable managed services strategy that also aligns with our product strategy? What are the most market relevant managed services offers for technology solutions? What is the optimal organization structure for a Managed Services business? What are the best processes to enable successful managed services sales? What are the key metrics that Managed Services organizations should monitor? What are the various go-to-market options for a Managed Services business? What are key operational processes required to successfully scale the business? What is the optimal delivery structure for managed services? What are the common practices used for pricing managed services offers? How do managed services offers relate to cloud services (SaaS, PaaS, IaaS, etc.)? Is it better to have a dedicated Managed Services Sales team or can it be a general Services Sales team? What technologies are companies using to support their managed services offerings? How do managed services relate to traditional service lines such as Professional Services and Support Services? thought leadership in managed services. Join our community of managed services leaders. 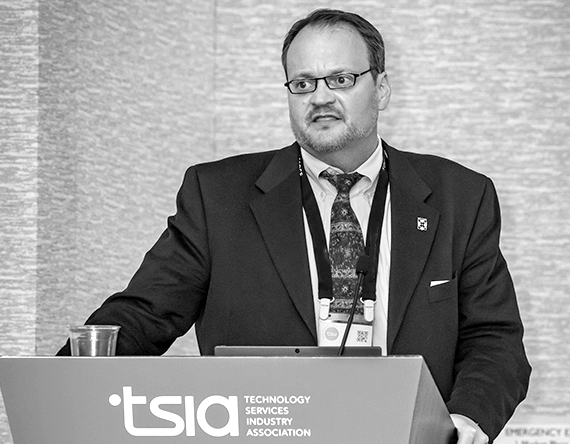 George Humphrey is TSIA’s vice president of managed services research. He works closely with member companies to deliver research and advisory programs focused on helping them establish, optimize, and grow their Managed Services business and achieve better customer outcomes. Achieving more effective service delivery at a lower cost. See the impact TSIA is making on the tech industry by helping Managed Services organizations improve their performance.